That is why this whole article is dedicated to the art of learning to write tragedy. As with every single story in existence, there is a plot. 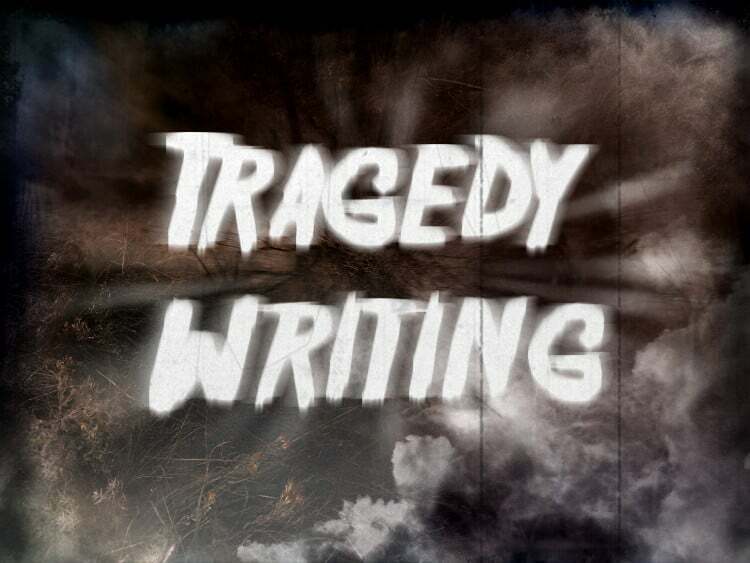 But in tragedy story, the plot needs to be fleshed out even more than any other genre. First, take your outline of events that will happen in the story. Focus on the details. Details bring a story to life. This doesn’t, however, mean that you should allow yourself to become too close to useless things, like what color bed sheets are. Second, make things more complex. This can mean anything, from a plot twist, to developing something about characters that makes them seem less two dimensional. Third, think about ways in which each character changes. In every tragedy, by the end, all characters should have changed in some way. If they have not, then you need to develop it more. Fourth, let your characters suffer. I’m not saying to let them just cry everywhere. Keep their emotions real, and on the same page as anyone who’ll be reading. All heros in tragedy story are met with some sort of downfall. Whether it be like Hamlet’s, in the tragedy by Shakespeare, or another. Chances are you already know what your hero’s downfall will be. So now is the time to expand on it. Add more to it. In a tragedy, all the important characters to the hero’s downfall should be introduced early on. This should help to explain the current situation, as well set up the hero’s rise to pride and subsequent downfall. Simile and metaphors have historically been really important to any tragedy writing. They give more meaning to the words on the page or the actions on a stage they give the readers/audience a reason to feel more involved in the story. Just remember a metaphor is always a simile but a simile is not always a metaphor. Strange, but true. First off, what is a metaphor? In story it is used like this: “His face was glowing.” Now, we all know that doesn’t actually mean his face was glowing, it is more likely to mean he was really happy or handsome. Now,what is a simile? An example is: “Her eyes glistened like stars as she cried.“ Once again, we know that it doesn’t actually mean her eyes are made out of stars or anything, it just brings a certain poetic quality to the story. Scenes are the most important part of tragedy writing, they are the framework for everything. Each scene should have a clear beginning middle and end which also contributes to the overall storyline. Every tragedies tension must have a resolution. You can’t just leave important events unresolved or end a tragedies without everyone’s life changing, usually for the worst in some way. Every loose end must be tied. Anything set in motion during the story must come to pass. Anything bad that happened during the story should have a meaning. Like most stories your tragedy must go under a revision or two once its finished. This will include filling in plot holes, providing further details to develop a character, rewriting chapters, or even getting rid or adding chapters. Also be sure to give yourself several weeks in between writing the story and revising it. It can be difficult to space yourself from it, but you must because the story may still be fresh in your mind right after you finish it, but that just means it’s more likely you’ll overlook crucial mistakes that will confuse your readers. Try to read through your story before you sit down and make any changes; Just be sure to make notes of any areas that are confusing or any plot holes, then you can decide how to remedy those problems once you have gotten through the rest of your story. Once you’ve read through and revised your story ask yourself if the story makes sense as a whole. Whether the plot feels smooth or jagged. Interesting or dull. If it’s not good, you will have to change it to make it more smooth and more compelling. Remember the the tragic hero should be a likable person with good qualities. Their demise should be the result of their own actions, whether these choices are the cause of their actions, your hero’s downfall should render readers to feel pity and sadness. If it doesn’t, then your story will probably need some serious revisions. And finally, think about the impact that the final story will have on your readers. Once you’ve pounded out the bigger revisions of your story during the revision stage you will need to do a thorough edit of the entire work. This will include spell checking, taking out filler portions of the story, etc. Make sure to choose your words and phrase your sentences meticulously and precisely. Cut out any unnecessary words (filler), confusing words, and poorly constructed sentences. Try to avoid repeating the same words and sentences needlessly. It will come as unprofessional and weak. Instead try to find new and interesting ways to get the point across. Be sure to resolve sentence fragments or run on sentences as these can be extremely confusing to readers.